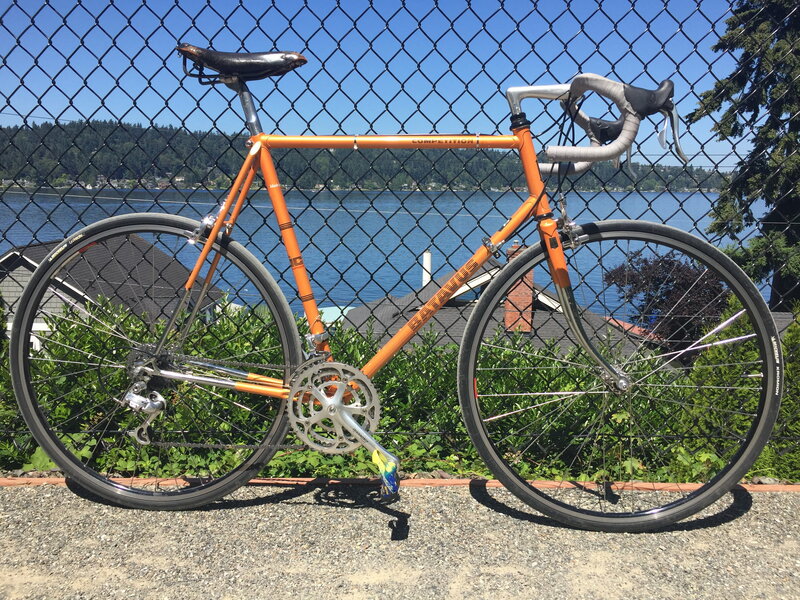 Took the new 'cross bike out for a ~14 mile easy spin. Okay, actually it wasn't that easy...partially because I was fighting a stiff headwind for more than half the trip, and also because those knobby 37c tires are freakin' slow on pavement! 29.51 miles in an attempt to dial in my touring bike. Maybe one more adjustment (moving the seat back a bit), and it should be good to go. Going on a 350 or so mile ride with my daughter in August and decided on taking my touring bike rather than my road bike. 11.6 mph @ 14.1 avg - GREAT trainer ride. Tomorrow will be my last hi country ride for three or four weeks as we are headed for TX gulf coast. 11.6 miles @ 14.1 avg mph. Great trainer ride. Today's AM ride was to Walmart on the grocery grabber. Yesterday's ride was my 68th Birthday ride. Out at 12:01AM in 81F temp. with 90+% humidity still smarting from prostate cancer surgery 13 days earlier. Disappointing beginning due to GI issues that continued, temps rode into the 90'sF then afternoon wicked thunderstorm put the kibosh on continuing the ride. Managed a paltry 169 miles but will have another go at it 2 weeks from tomorrow when I have my Pete Cornell Memorial Ride. Christened a new set of Conti Gator Hardshell tires with a 13.25 mi. late-afternoon ride. Mileage was about average for me since returning to the bike after a health-related 15-year layoff. So far, 219.94 miles since spring (outdoor miles only; I don't count LifeCycle miles at the gym). A red-letter day for celebration and yet no photos/video? We are sorely disappointed. Bike, hike, float = cross training day at the Snoqualmie Summit recreation area. The Pacific Crest Trail passes through right here, for folks seeking a walk from Mexico to Canada, or vice versa. Why not show your entire bike? 62 mile lump-in-your-throat beautiful day on some nice, quiet paved roads on the flat part of my little state. This photo is begging for a focal point (yes, I see the rock sculpture). Although it would make a great background as it stands. Tuesday - 19 miles as a bike commuter. While the Tour de France plays out, we do the Tour de Fort Worth here in Texas. It's not competitive, just a series of rides in different parts of the city almost every day while the TdF is taking place. Last night our bicycle club led the ride. It was weird because the ride was officially canceled by the city due to weather, but the rain cleared out before ride time so we rode anyway, with a smallish group of 20-30 riders. I rode my fixed gear bike and ended up with 30 miles (including to and from the start point from my house). 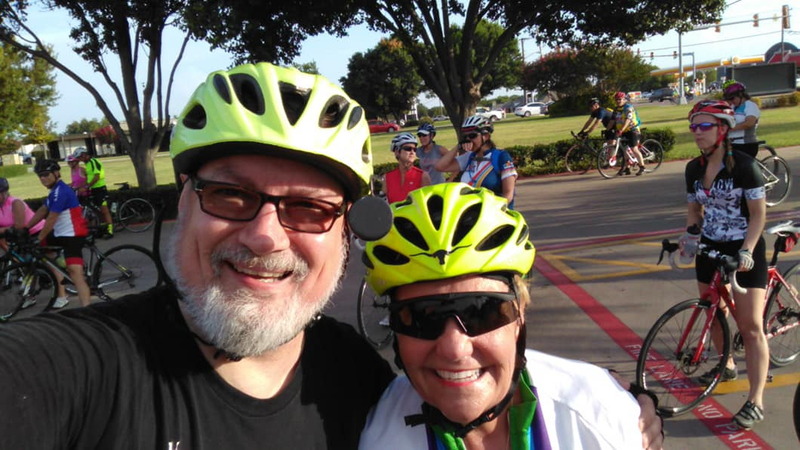 I rode again tonight; this time the crowd was much bigger, more like 200-300 riders, including Ft Worth Mayor Betsy Price. Here's a pic of me and Betsy. Tonight's distance, also fixed gear, was similar- I ended up with 29 miles. There was some big local sponsorship tonight, so after the ride there were free beers, free tacos, and free desserts. it was supposed to be hot today but I don't think it was over 85°. I keep riding the same route, I'ts the most rural and beautiful of my rides. 51 Miles. I came across a cyclist who seemed to be having trouble with his mini pump. I was going to offer mine. He seemed very agitated, I looked at his wheel and he hadn't loosened the valve on his presta tube.He looked a little like a tweaker with lots of home made or prison tattoos on his arms. I quickly decided it was probably a stolen bike. He wasn't wearing any cycling clothes. He was riding a Raleigh with drop handlebars, toe cages, I didn't get a look at the group set. He became more agitated and told me I could go. I was glad to get away from him. There was some big local sponsorship tonight, so after the ride there were free beers, free tacos, and free desserts. Sounds like a great time. I’ve spent many hours riding the Trinity River trail there and I assume that’s a big part of th event? Yesterday I rode 2.0 hours in 105 degree heat index, and was not feeling well the rest of the day. Today I am still not feeling very well. So to be on the safe side, I will skip today's ride, and stay inside in the AC. Location: Carlisle, in England's Lake District, just a few miles south of the border with Scotland. Bikes: A Bianchi C2C road bike, a steel framed touring bike and a Xootr Swift folder which has made the rest redundant! Enjoying a long spell of fine sunny weather here in the north of England. Managed to cover 33 miles today - most of it uphill! 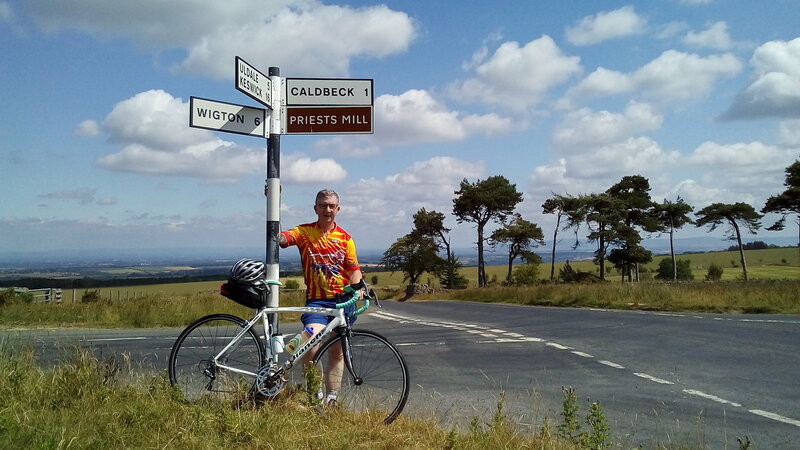 1797ft of climbing up gradients touching 12%.67 year old legs are now starting to ache but it has been a great day. 62 hot and humid miles yesterday and 40 more hot and humid miles today. The sun is evaporating much of the flood water along the roads and it's been like riding in a rain forest. Sounds like a great time. I’ve spent many hours riding the Trinity River trail there and I assume that’s a big part of the event? Some of the rides use the trails. Last night's ride was primarily on Vickery Blvd. (I linked my Strava trace in the last line of my earlier post). It was a large enough group that the FWPD provided traffic control. I'm sorry I missed that one. I'd heard it was canceled so I snoozed. Woke up late, took an 18 mile ride west toward the Walsh Ranch development. Only my second outdoor ride on the road bike since the May injury. Felt good to get outside despite the muggy weather and aching shoulder and neck. 35 miles with a buddy on the Northern Rail Trail in NH. Couldn’t have asked for a nicer day for riding. Nice to chat with the cyclists who stop at the Danbury Country Store. Last time I rode this trail I came home with a couple of ticks. This time I was careful not to venture off the trail and still picked one up. Really nice trail, though. More heat and humidity and another 40 miles. Rode this one with my buddy Frank C.
Only mad dogs and Englishmen go out in the midday sun. Where’s that helmet mounted misting accessory I need. Hot and humid again, didn't get started until midday because of work, but sweated through 12.34 miles -- again, about average for me while I fight through some soreness in my sacroiliac joint. Life is good. Today was officially a knozone action day in Indy - Action Day - Knozone - so biked to work but tried not to inhale. I'll only stop if it is requested, as "no good deed goes unpunished." Or so it seems. I live just North of downtown Long Beach Ca = lots of tweakers/bicycle theft. Lost a Trek. Rode 38 early morning miles yesterday and headed out for more today. At 71 it is time to get serious again. Yes, i need to take photos. How i've resisted it. 72 miles @ 18.3 mph. Great day to ride in Maine!! Ft. Worth has much more of a "cool factor" than Dallas does. Better people, better food, better entertainment, better atmosphere. I spend time there every couple of years. Probably won't today, as I have an commitment this evening..
the ride there was during the heat & humidity of the day..
the ride back was during a gnat hatch (trail runs right alongside of the river).